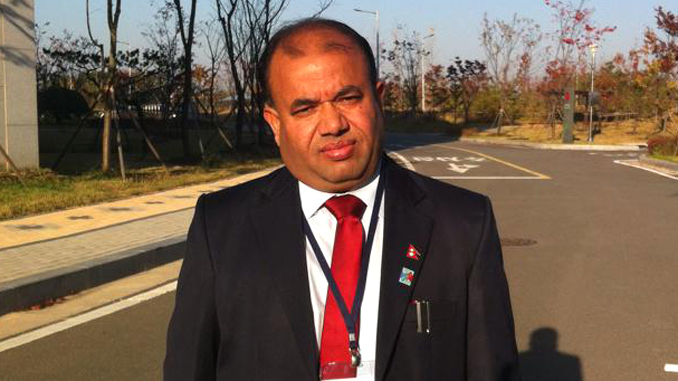 Pokhara—The dead body of Om Raj Paudel, senior officer of Pokhara Lekhnath Metropolitan City office and gone missing for 22-day found at the bank of Seti River in Bhimad of Tanahun district, Nepal Police confirmed. Paudel had written a brief note in the name of his wife Urmila and put his personal mobile phone sets and jewelries in his home before leaving for morning walk on June 23, 2018. Since then he was missing and his search operation was undergoing in the possible locations including Seti River gorges. According to Police, Paudel’s family members identified his body and further process has been started including postmortem that would be carried out in Western Regional Hospital Pokhara following the arrival of the body. Paudel had left home saying that he was going to take part in a cleaning program but he didn’t come back home later. Security personnel same day had launched a search operation following a woman’s information that a fat man leaped from the Seti River bridge of Mahendrapul Bazaar of Pokhara in same day. Later, a group of Pokhara canyoning also took part in search operation by going down to the river near Tulshi Ghat of Seti River but found nothing. The search operation was focused in Seti River as a Paudel was seen walking near Mahendra Bridge above Seti River in a CCTV footage. The time that Paudel was captured in CCTV, the woman’s information and the color of his wearing happened to match each other. Paudel had written in his note that dear Urmila, I remained fail to back you lifetime though you loved me so much; Leaving three kids as your responsibilities; Have a good time; Bye forever !